Great experience with the Go Wild Team this morning. Right from the pre-flight checks the night before to the landing, our pilot Harry did a great job and explained what he was doing as we drifted across the Yarra Valley. Breakfast at Chateau Yering Hotel was also a delight. The Yarra Valley is a leisurely 40 minute drive from Melbourne CBD. Find the best transport options. Experience the Yarra Valley at your own pace and soak up many of the delights on offer. Go Wild Ballooning was established in 1989 by the Fraser brothers who pioneered the first hot air balloon flight in the Yarra Valley from the family vineyard ‘Tarraford’ located near Yarra Glen. A short 40 minute drive from Melbourne CBD, Yarra Valley hot air balloon rides offer spectacular views of the Yarra River below, mountain ranges, vineyards, the Melbourne CBD skyline and distant views of Port Phillip Bay. Our sunrise hot air balloon flights can offer these amazing views and more in a tranquil atmosphere, this experience is like no other. Melbourne’s Yarra Valley is surrounded by mountain ranges that provide us with cool, stable conditions at dawn, perfect for hot air ballooning. This famous wine region has cemented itself on the world stage as a major tourism destination show casing award winning wines, heritage accommodation, cafe’s, restaurants, breweries and distillaries. Complimented with the superb local produce and delicacies, the Yarra Valley is also a foodies favourite destination. Our 15 year association with the renowned 5 Star Chateau Yering Historic House Hotel, our meeting point and preferred accommodation & breakfast venue is clear testament to the dedicated service we offer our customers. You deserve the very best. Skip forward 29 years and the family tradition of flying hot air balloons continues with two young Fraser’s joining the team. Our newest members are the future of our industry. Their enthusiasm, skill & commitment combined with the immense knowledge from our Chief Pilot makes ‘ballooning talk’ educational and highly infectious. The future of hot air ballooning in our beautiful Yarra Valley is very exciting. Let us share this amazing experience with you. Hot Air Balloon Rides Available 7 days per week. Check out the Gallery and the latest images of Harry & Mia Fraser flying over the summit of Mt Kosciuszko, July 23rd 2018, the highest peak in Australia. Thank you very much for the wonderful experience with Go Wild Ballooning. Audrey and I really enjoyed ourselves up there in perfect weather last Saturday. The certificate is very lovely too. The journey begins outside of Melbourne in Victoria’s most beautiful region. Along the perennial Yarra River lies the Yarra Valley, a province internationally known for its thriving wine industry, something not to be missed. The very climate that produces award-winning grapes also fosters the lush scenery that stretches across much of the area. Take in views of undulated fields of green, manicured vineyards and stunning mountain ranges as we drift along the river’s meandering path. 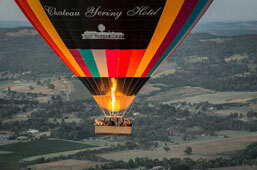 Come see for yourself exactly what makes Melbourne’s Yarra Valley the perfect setting to experience by hot air balloon. Go Wild Ballooning has been providing hot air balloon flights in Melbourne, Yarra Valley since 1989. The Yarra Valley’s first established ballooning company, we pride ourselves on being the most experienced and professional hot air ballooning company in all of Victoria, you couldn’t be in better hands. Discover the explorer in you. Email / Contact us on (03) 9739 0772 to arrange your hot air balloon flight over Melbourne’s Yarra Valley.